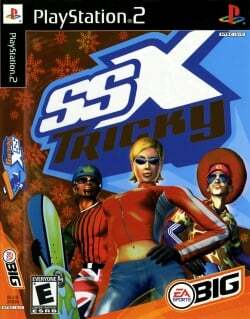 Game description: SSX Tricky launches you into a world of monster air, intense tracks, and death-defying tricks. Six all-new competitors plus six riders from the original SSX make up the circuit. Compete in the World Circuit, go head-to-head in the Showoff versions of nine courses on the World Circuit, or just practice in Free Ride. With all-new Garibaldi and Valdez courses, you'll have plenty of huge cliff drops to catch big air and pull off Uber tricks. Gameplay continues the same basic method introduced in SSX, with the main tracks being 'remixed' from the previous games and two new tracks, Garibaldi and Alaska. The important new feature added to the series are the Uber moves. If players are able to fill their boost bar to the maximum, they will be able to perform Uber moves which involve characters taking their feet off their board. Also introduced in the game is a rivalry system in the World Circuit mode. If the player is friendly with another AI character, they will treat the player favourably. However, if the player ends up annoying other AI characters, generally by attacking them during the race in order to fill the adrenaline bar, they will become hostile towards you in future events. This page was last edited on 13 July 2018, at 18:39.